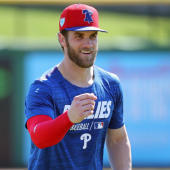 Hermosillo is still dealing with scar tissue breakup in his groin following offseason surgery but should return to the lineup within a few days, Rhett Bollinger of MLB.com reports. If Hermosillo is indeed able to meet that timeline, he shouldn't have much problem getting up to speed by Opening Day. He's expected to be the Angels' fourth outfielder this season.